Thanks for the podcasts! Keep’em coming! Are there any DGS in Canada? Oh, and Moldvay all the way! To answer your question, no I don’t believe we have a Canadian chapter of the DGS. Maybe you can start one. This is the first episode of DGS that I have heard, and thoroughly enjoyed it. I’m really hoping that you tackle some of the lesser known non-TSR games in later episodes. Thanks Mick, and yes we do plan to hit the lesser known games of TSR. 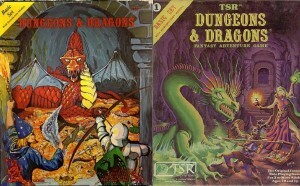 Our plan is to get through the versions of D&D up to at least 1st edition AD&D then start heading off into the other games that came out during the mid to late 70’s like Boot Hill and Gamma World. FYI: I had received a copy of The Moldavy (magenta) boxed set for Christmas when it first debuted. I left it at home on a trip to my Grandmother’s home and bought a copy of the Holmes edition to keep playing without my first set. It came with chits and B2 was the module. I have never owned B1 but have 2 copies of B2. Concerning the silence of the dead. Just use common sense. We might be asked to suspend our disbelief when playing these games but I don’t believe that should necessarily mean that we abandon all of the laws of physics, unless of course your campaign is set in some alternate plane of existence wherein sound doth not travel.